If you are feeling overwhelmed often there may be some things you need to look at. While it is natural to feel the occasional overwhelm, existing in an overwhelmed state every day or very often isn't healthy. If this is you, take a look at the following list and rectify things to bring you back into balance. Do you consume stimulants regularly (caffeine, alcohol, drugs, cacao)? Do you smoke or are around second hand smoke? Do you consume foods that contain chemical ingredients? Do you live where there is air pollution? Do you over exercise? Are you sedentary? Do you use chemicals on your skin, hair and teeth? If the above list describes you, then it is a safe bet that your entire system is being overwhelmed and taxed, your emotional state included. Living like this means you will have a low tolerance to things and you may become overwhelmed very easy (and you will be more prone to getting physically sick too). Bringing the above list into balance (even just working on one thing on the list) will help your entire system to become stronger, thus helping you to be more resilient and less overwhelmed. Know that it will pass, everything is cyclical. If it never rained you would never be able to see rainbows. It is very important to clean your home with only natural ingredients. Did you know that the air pollution level inside people's homes is often higher than outside!! This comes from the myriad of toxic chemical cleaners, laundry detergents, air fresheners, body care products and so much more that people choose to use in their homes. Their is no need to use toxic chemical concoctions to keep your home clean … there are natural, safe and health building alternatives. Here is an extremely simple recipe for a super effective all-purpose cleaner. In a glass bottle put in the thyme leaves (stems are okay too). If using dried thyme, fill bottle about half way. If using fresh, fill the bottle almost to the top with the thyme. Next, pour the white vinegar into the bottle to the top, covering the thyme. Let sit for at least 24 hours. I usually let mine sit for several days, longer is okay too. You will notice the vinegar turning a beautiful pink colour. Strain, compost/discard the thyme, bottle the infused vinegar into a spray bottle and label. 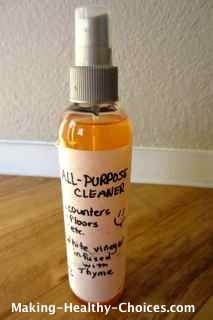 This is a beautifully smelling, completely non-toxic cleaner that you can use on all your counter tops, appliances, floors, sinks, mirrors etc. It is naturally anti-bacterial, anti-microbial and anti-fungal. For more information on healthy ways to clean your home, click here. I love technology and I really love it when it actually helps me in a healthy way! I spend a lot of time (too much sometimes) looking at the computer screen. I often find that my eyes become very tired and dry. I always dim the brightness of my computer screen which seems to help but I just found this great little app that helps even more. It is called Flux and what it does is it matches the brightness of your screen to the ambient brightness around you. So in the daytime your screen is brighter but at night time it dims to a beautiful soft candlelight effect. I have chosen the candlelight effect but there are other options as well … and you can also adjust the brightness for day and night. I have been using this little app for a few weeks now and I am loving it. Bottom line, it is not a solution (the solution is to spend less time on the computer) but I do find it easier on my eyes. I have no affiliation with the company that created this app, I found it and liked it and wanted to share it with you.